The collaboration between Trideus, Belgian Cycling Factory, Voxdale and Flanders Bike Valley is one of the eight innovation projects that receive a subsidy of 50,000 euros from the province of Limburg. Together with our partners, Trideus will design tailor-made bicycle parts, produce them through 3D printing and subject them to intensive testing. In this way we provide professional cyclists with the best material that allows them to deliver top performances in all circumstances. The provincial innovation subsidy wants to boost Limburg companies that join forces in an innovative partnership. Trideus believes in strong collaborations. We set ourselves the goal of introducing a wide range range of 3D printing applications in as many sectors as possible. Within the bicycle industry, Belgian Cycling Factory, the producer of bicycle brands Ridley and Eddy Merckx, is one of the pioneers in applying this new technology. 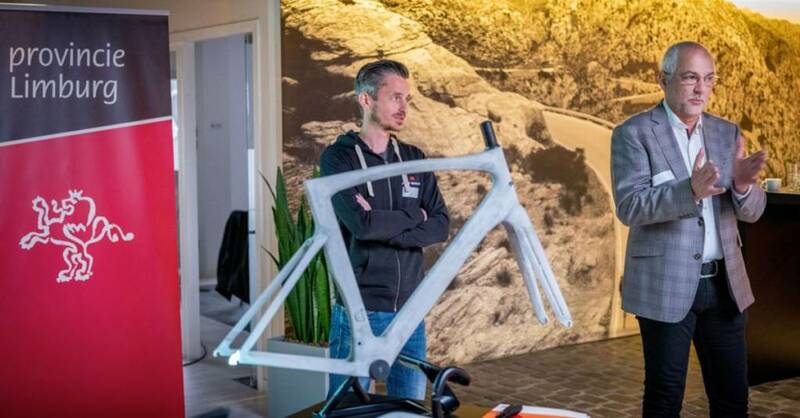 Together with Flanders Bike Valley (Beringen) and Trideus, they use 3D printing to provide professional cyclists with the material that allows them to deliver award-winning performances. Winning a cycling race? That's pure science! The actual development happens in 4 steps. Together with Voxdale and Belgian Cycling Factory we provide a design that will then be 3D printed by our experts. After the manufacturing process, every component is tested in the Flanders Bike Valley wind tunnel in Beringen (where Romain Bardet recently started preparing his 2019 Tour de France). After an evaluation of the results, the product is finally being developed. Or adjusted. The technology of 3D printing provides a significant cost and time saving compared to traditional development methods. And there is more: developing a bike-specific mannequin. Investing in innovation is investing in employment. At Trideus, we are confident that innovation will not only result in new, ground-breaking products, but will also boost employment in the region. This subsidy from the Province of Limburg is already encouraging us to further focus on the growth of 3D-printing. The non-stop evolution within 3D-printing technology strengthens our conviction that many companies in Limburg can derive a great advantage from one of the many areas of application. The wish of Arno in fulfillment!